Will you strike a bargain, swearing fealty to one of the fell masters? Or will you attempt to master your own fate, pitting your luck and skill against arcane foes? Whatever you decide, you must act quickly, for grey worms press in from all sides and time grows short! 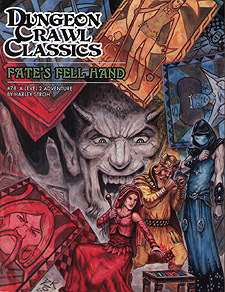 An exploration-based adventure, Fate's Fell Hand challenges new and old players alike. Only the most cunning can hope to thwart the machinations of three dire wizards and escape Fate's Fall Hand!